I love burlap. I just low everything about it. Well, maybe not everything. It's usually a little scratchy to sit on, but other than that, I love it. 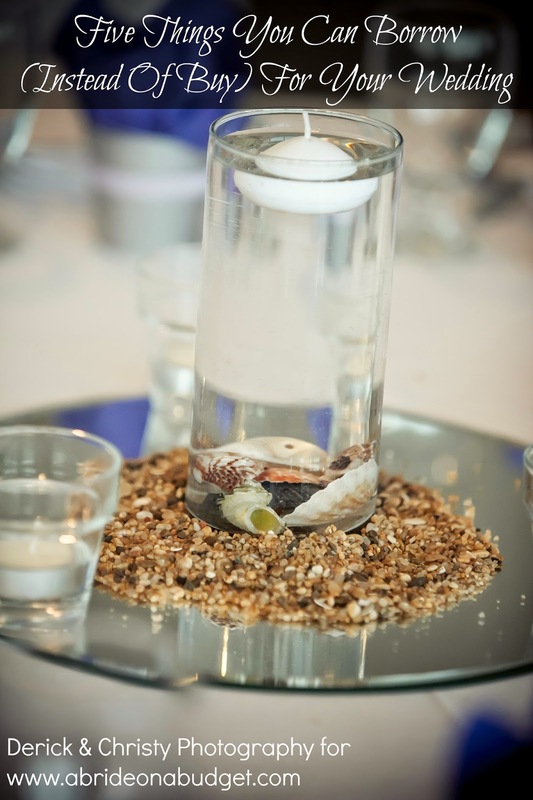 It just looks so pretty and adds such a homey element to your rustic wedding. And lace, oh it's just lovely. Burlap and lace is just such a romantic combination to incorporate into your wedding. 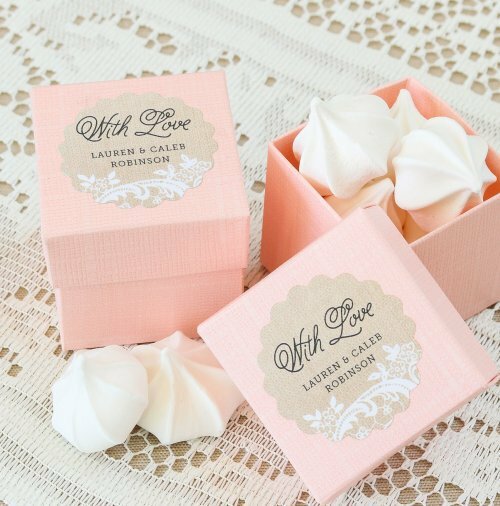 And if you are, you definitely want to have your wedding favor reflect that. 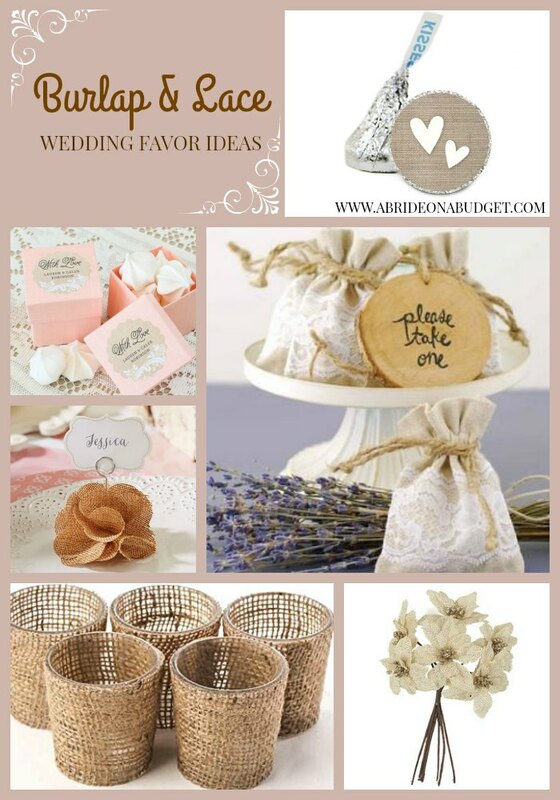 I put together a list of my favorite burlap and lace wedding favor ideas to help you pick out something perfect. 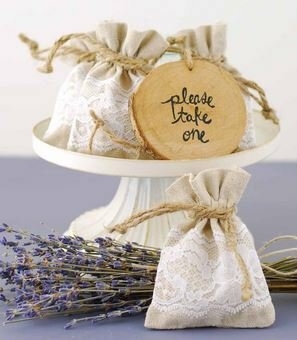 I'm starting this list off with these pretty burlap and lace favor bags. It incorporates both parts of this theme, plus, they are just simple. You fill them with anything you want, pull the strings, and you're done. That's it. You can fill them with something tasty, like wrapped candy, or something fragrant, like lavender. It doesn't matter what it is, or what color you choose, because these bags will hide it anyway. 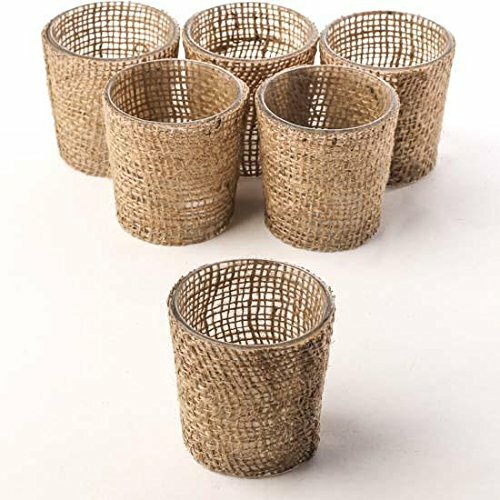 If you're having a rustic wedding and you're inviting me, please have these burlap covered glass votive candle holders as your wedding favor. I will take home mine, and Pete's, and any that get left behind on our table (although I can't imagine there will be any). I just love them. Plus, they perfectly fit votive candles, which I happen to always have lying around. They're something your guests can use too, especially if you already fill them with unscented votive candles, so they're just great. I really think edible favors are a great way to go ... and you pretty much guarantee your guests will take them. But you still want to make them a little personal. 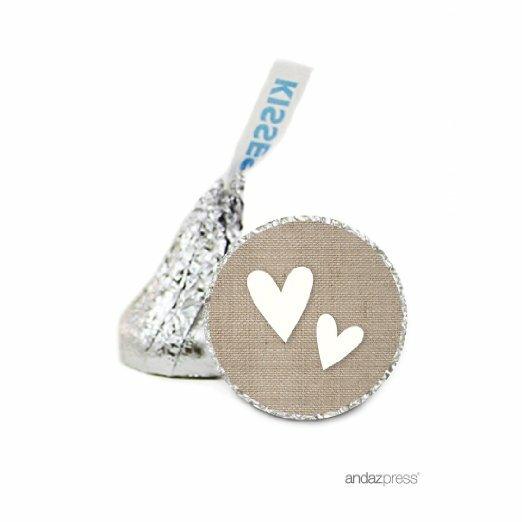 That's why these country burlap Hershey's Kisses stickers are great. All you need to do is buy Hershey's Kisses and stick these to the bottom. Easy. Plus, you can have a wine and cheese night with your bridesmaids to do them (just make sure to buy a couple extra Kisses in case they, um, go missing). We have a lot of coasters. A lot. We keep some in every room and it really works out well for us. I know your guests will love them too. 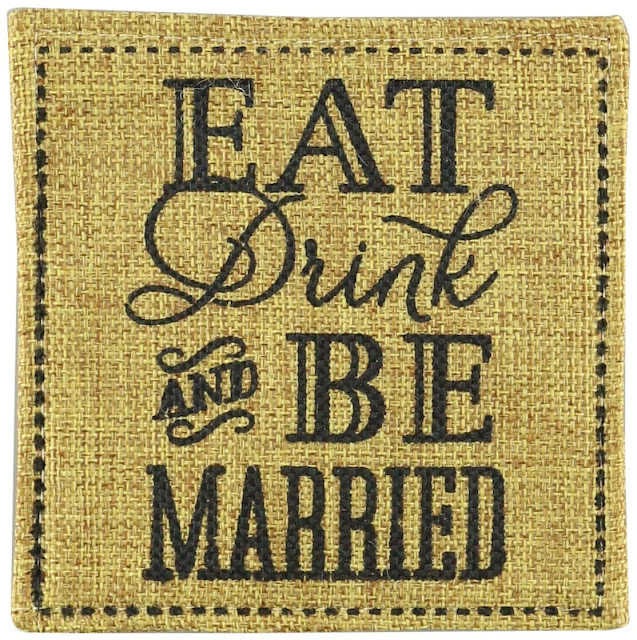 So definitely check out these Eat Drink And Be Married burlap coasters. They're functional and match your theme. Gotta love it. I remember leaving a friend's wedding and being handed a personalized water bottle. It was great. After a night of dancing, hydration on the way home was so important. And it was totally appreciated. 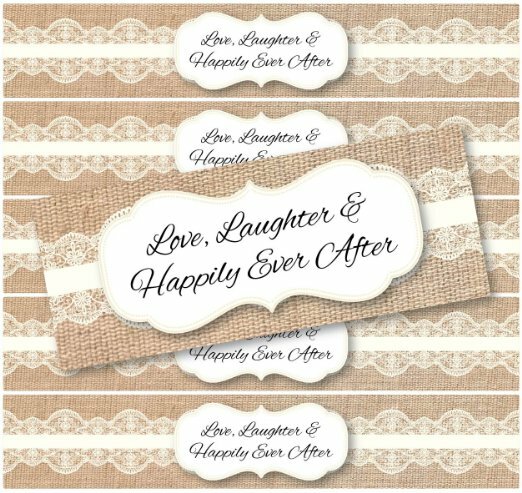 If you want to do this, pick up these cute burlap and lace water bottle stickers. 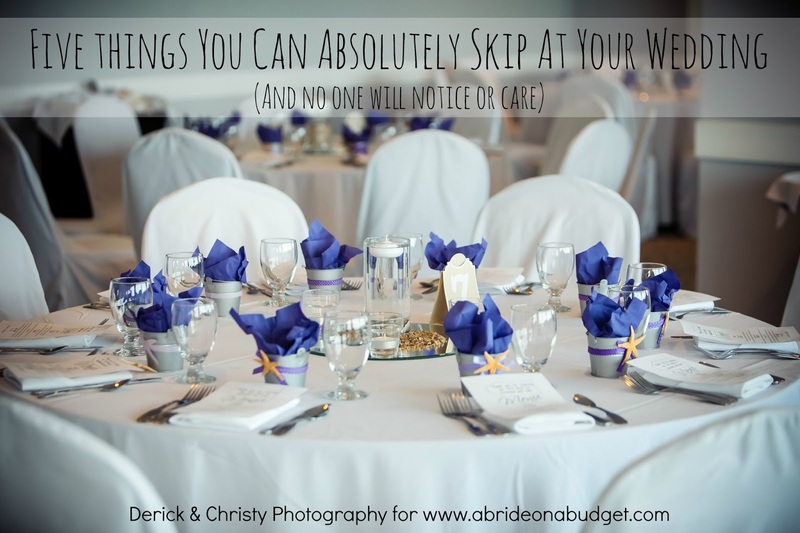 Be sure to give them to your venue and let them know you want them handed out when your guests leave. Pete and I used a seed card to plant lettuce at his old apartment, but we moved to North Carolina before we were ever able to see if it sprouted. It was so fun, though. 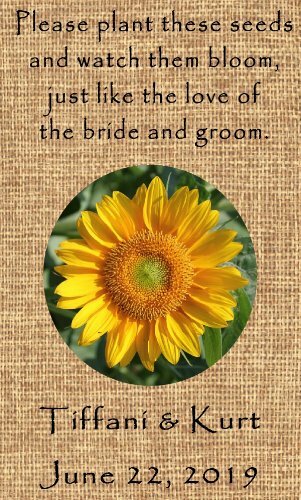 And if you give out these burlap sunflower wildflower seed cards and they do sprout, your guests will think of you every time they look at the flowers. And, I mean, watching your love bloom? So romantic! 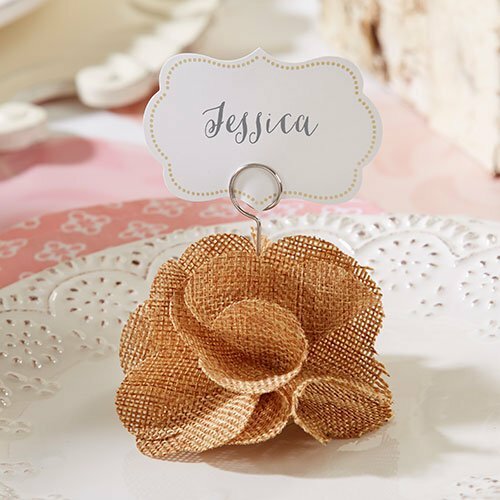 I'm obsessed with these burlap flower place cards. Obsessed. I just think they are so incredibly pretty and will make for a gorgeous welcome table. 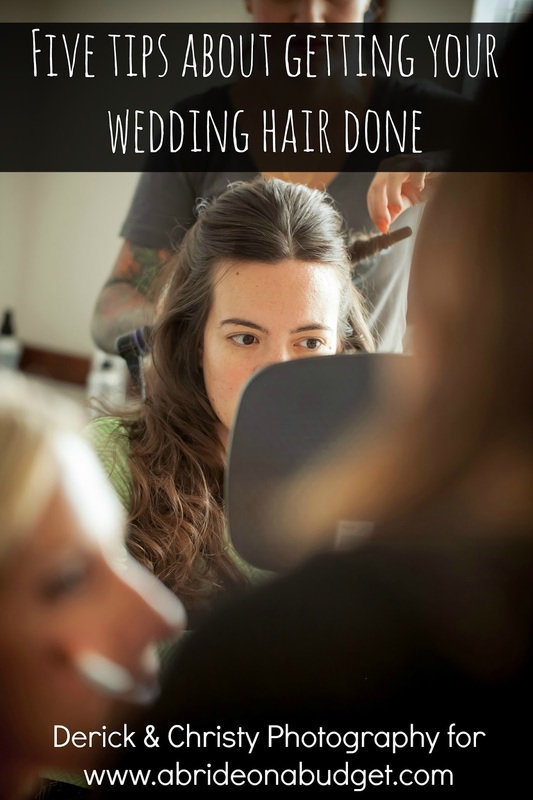 Plus, after your wedding is over, your guests can use this to hold a picture from your big day. I just love it ... and would actually like to like the entire mantle over our fireplace in this. So cute (until someone mistakes them as kindling, anyway). Like the bags from earlier, this is another case where what's inside doesn't matter as much as what's outside. These are just stickers (not the boxes), so you can fill any box with any sort of treat or trinket, then affix these pretty labels. Your favors are coordinated ... and done really easily. If you're not into stickers, no worries. 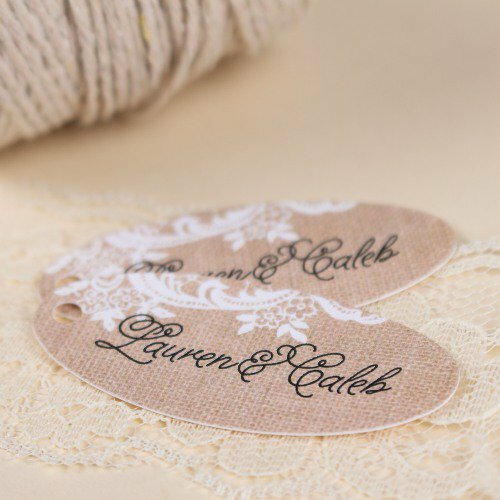 Just go with these personalized burlap and lace wedding favor tags. They look very similar to the stickers above, but they're not sticky. Instead, you have to tie these onto your favors. Personally, I would go with jute twine to keep with your theme. 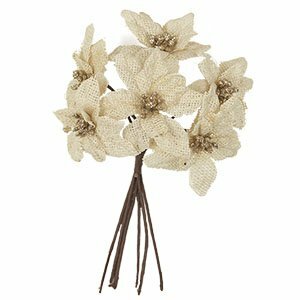 If you need a use for those tags from above, maybe tie them around a single stem from this burlap poinsettia bunch and set one at each place setting. I'm really just in love with these. There's something about them that makes me so happy and I know your guests will love them and display them in a slim glass vase. It's perfect. BRIDAL BABBLE: Which of these burlap and lace wedding favor ideas is your favorite?